The moon jelly is a primitive animal which lacks respiratory, excretory, and circulatory systems. The adult medusa is transparent and looks much like an umbrella with tentacles. It has bright gonads that are under the stomach. There is a nerve net that is responsible for contractions in swimming muscles and feeding. Adults can have diameters up to 16 inches and are either male or female. Moon jellyfish are typically translucent white, but may take on a pink, purple, or orange hue depending on their last meal. 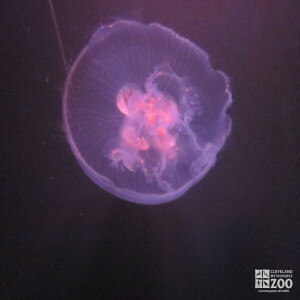 It is rare for moon jellies to live more than 6 months in the wild, though aquarium jellies may live for several years. They are eaten by a wide variety of predatores including ghe Ocean Sunfish and the Leatherback Sea Turtle. 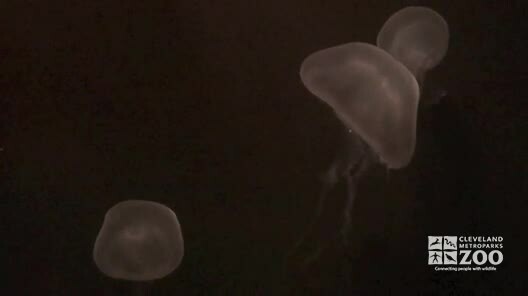 Sea Birds may also prey on moon jellies. Polyps may live for up to 25 years. Did you know? : The stings of moon jellies are not dangerous to humans. Jellyfish are not really fish, and many scientists are now referring to them as "jellies." A group of jellies is a smack. A large group of jellies is called a bloom. In 1991 over 2000 moon jellies were sent into space on the space shuttle Columbia to study the effects of weightlessness on their development. Moon jellies are found in coastal waters around the world. Moon jellies live near the surface in coastal waters worldwide. They frequently swim in schools. They may move inshore at breeding time. They travel with the tides. The polyp looks like a small plant and is attached to rocks or seaweed. Food is caught by a moon Jelly with its nematocyst laden tentacles, tied with mucus, brought to the gastric cavity and passed into the cavity by ciliated action. Moon jellies have a life cycle that involves both sexual and asexual reproduction. Males release a strand of sperm which the female will take internally through the mouth for fertilization. Fertilized eggs develop in pockets that surround the mouth until they are ready to be released. Upon release, they develop into a planula, or larva. The planula spend a short period of time free swimming before settling in one spot as a polyp. The polyp will reproduce asexually by creating clones of itself which will bud off the polyp and released to the water. These released clones look like small plates with multiple arms. They develop a complete bell after approximately 3 months. Sexual maturity commonly occurs in the spring and summer. Once mature, these jellies call medusa, will reproduce sexually and the cycle will continue. Plankton that includes organisms such as mollusks, crustaceans, tunicate larvae, copepods, rotifers, young polychaetes, protozoans, diatoms, eggs, fish eggs, and other small organisms.